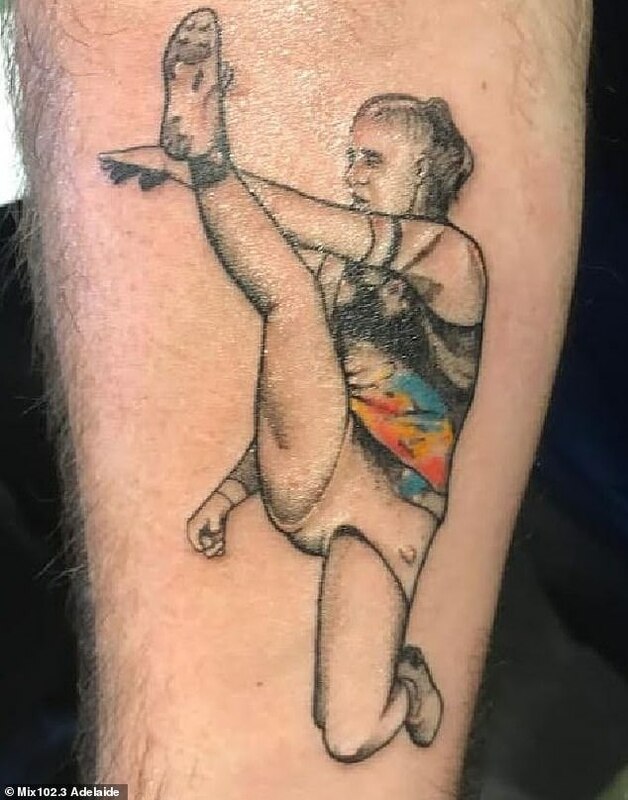 A footy ‘super fan’ has gone above and beyond to showcase his support for AFL women’s star Tayla Harris, tattooing the now iconic image of her kicking a goal on his forearm. 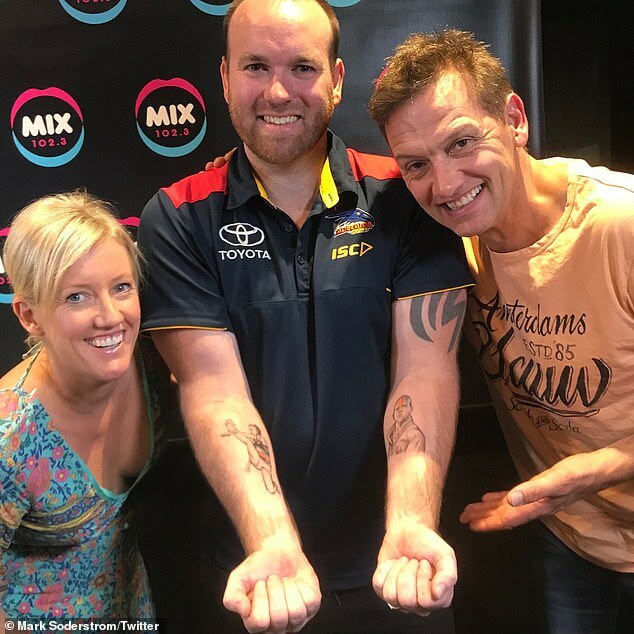 Blake Griffiths, an Adelaide supporter who also has Crows coach Don Pyke inked on his other forearm, told listeners on Mix 102.3 Adelaide he ‘couldn’t be happier’ with both designs. Griffiths added he was looking forward to showing off his new tattoos from behind the bar – especially to rival Port Adelaide fans – when pouring beers at the pub he works at. ‘It all came about after I was listening to the radio (MIX 102.3) this week,’ Griffiths told Daily Mail Australia. ‘They mentioned a Port Adelaide supporter had a tattoo of (coach) Ken Hinkley, and put a call out to see if anyone was willing to have (Crows coach) Don Pyke. Mr Griffiths made his way to the studio on Thursday morning, and after talking to co-host Mark ‘Soda’ Soderstrom also decided to get Tayla Harris on his left forearm. ‘He (Soderstrom) talked me into it, but I didn’t need much convincing,’ the father of two young girls added. Earlier this week, Carlton AFL women’s star Harris, 21, became the unwilling target of online trolls who made a number of sexist and derogatory comments about the athletic image of her which has since gone global. ‘These people need to be called out by the AFL, but something needs to go further. It is something maybe Victoria Police have to look at,’ she said. Australian Prime Minister Scott Morrison weighed into the drama on Thursday, calling the trolls ‘cowardly grubs’. ‘They are nothing new unfortunately. They are cowards, they are weak,’ he said. McLachlan added the online trolling this week of Harris is a society issue which needs to be urgently addressed. ‘It’s more a challenge with the platform, social media, because this is not an isolated incident,’ he told reporters in Sydney.